(Host) There was good news Monday in Wilmington’s storm-damaged business district. The owners of Dot’s, an iconic local eatery, announced plans to rebuild the restaurant – with substantial help from its many friends. VPR’s Susan Keese was in Wilmington for the announcement. (Keese) There were plenty of vintage "eat at Dot’s" tee-shirts in the crowd that gathered outside the restaurant near the intersection of Route 9 and 100. 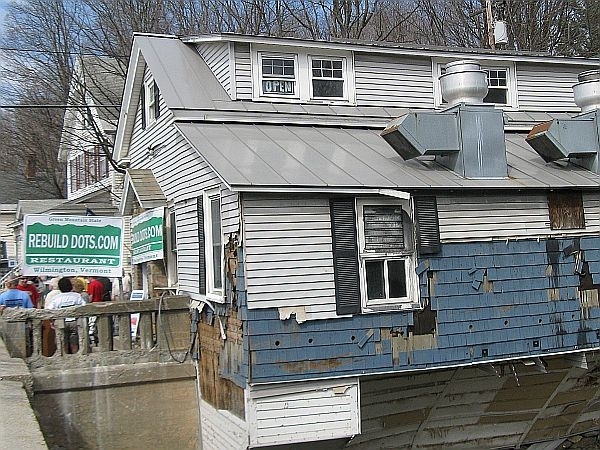 The building has been closed since Tropical Storm Irene’s flood. But now it’s draped with banners with the fundraising website RebuildDots.com in big letters, waving in the March sun. (John Reagan) "Kind of looks like a Sunday waitin’ line." (Keese) At the podium, John Reagan compared the crowd to the waiting line outside the restaurant on a foliage or ski weekend. Reagan and his wife Patty have owned Dot’s since the 1980s. It’s been a restaurant since at least the 1930s. And before that it was a general store and post office. The restaurant sits above the Deerfield River. And in the storm last August, it took a direct hit. The Reagans were told at first that the damage was too severe to bring the building back. But after working with a structural engineer – and the Preservation Trust of Vermont, Patty Reagan says, the assessment changed. (Patty Reagan) "And then we just got so much community support from… everywhere. It was like, ‘If you can just make it happen we’ll help you.’ It’s going to take a lot of help. We can’t do it on our own." A local fundraising group called Friends of the Valley has pledged to raise a hundred thousand dollars to support the renovation. The effort also received $50,000 from the Wilmington FundVT, recently formed by Wilmington second-home-owners. 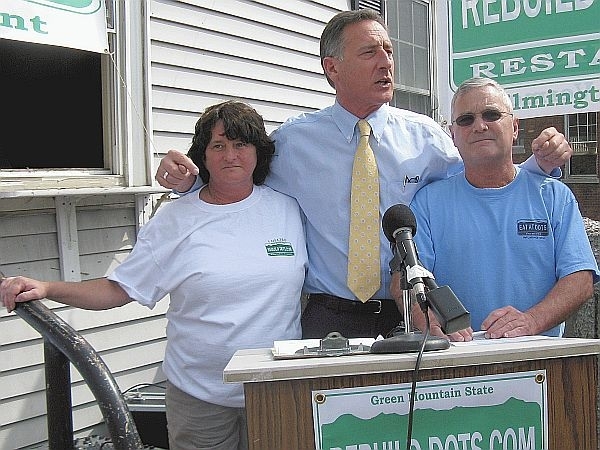 Governor Peter Shumlin praised Dan Kilmurray, a second homeowner from New York who founded the fundraising group. The group also just purchased a key downtown Wilmington building. (Shumlin) "You realize how great Vermonters are when you see not only those who live here every day, but those who wish they could live here everyday here making this a second job, a first priority." (Keese) Shumlin also praised Wilmington. (Shumlin) "There is no better example of community spirit, of tenacity, of caring about each other and of pulling ourselves from the bootstraps than you see right here at Dot’s." Dot’s co-owner John Reagan told the group that he feels less like an owner at this point and more like a steward of something that should be preserved for future generations. For VPR News, I’m Susan Keese in Wilmington.